Better Stock: Verizon Communications Inc. vs. AT&T Inc.
Top telecommunications companies have a huge lead over smaller rivals, but only one can be the best stock. Verizon Communications Inc. (NYSE:VZ) and AT&T Inc. (NYSE:T) are the two dominant wireless companies in the U.S., easily passing Sprint and T-Mobile in both subscribers and network size. The position has made them something of a duopoly in the market, which leads to incredibly strong profitability. The question for investors is: Which stock is the better buy? Here's a look at how Verizon and AT&T stack up. 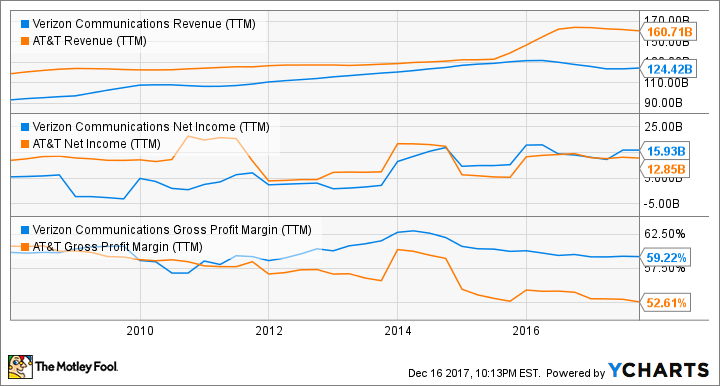 You can see below that AT&T is the bigger company from a revenue perspective, but Verizon has generated more net income over the last few years. The big reason for Verizon's better bottom line is its superior gross margin. The company clearly has some pricing power in the market, and is exploiting it today. But that better operating position may not last. Where Verizon and AT&T start to look different to investors is their strategic moves to build a telecommunications company of the future. Verizon bought Yahoo earlier this year for $4.5 billion, which will be added to AOL to create a company called Oath. It could be argued that Oath is just the remnants of an internet that's long lost its value for investors. AT&T, on the other hand, is attempting to acquire Time Warner Inc (NYSE:TWX.DL) to combine telecommunications and media assets. This would allow AT&T to bundle wireless with TV and internet for millions of customers. And given the FCC's recent decision to overturn net neutrality, AT&T might be able to give its own customers a superior experience with Time Warner content. Strategically, AT&T is making better moves, and is adding adjacent businesses that will give it pricing power in the future. But the right strategic moves now could have costs elsewhere down the line. When we look out 5-10 years to see which company will be able to build the better 5G network to drive the next phase of growth, the strategies I laid out above become important. You can see that both Verizon and AT&T have debt loads around $115 billion after going on buying sprees the last few years. If AT&T's proposed buyout of Time Warner goes through, about half of the $85.4 billion purchase price will be paid for from the balance sheet or new debt. The company said it has a $40 billion bridge term facility to finance the deal, but you can see that the balance sheet will be stretched further. This is important because both Verizon and AT&T are rolling out 5G networks that will drive a new generation of connected devices. It won't just be smartphones using 5G -- cars, VR headsets, and smart cities will use 5G, just to name a few applications. Given Verizon's higher net income and lower net debt (assuming the Time Warner deal is completed), it may have a better balance sheet for building a 5G network going forward. There's no clear-cut winner between Verizon and AT&T, but the stronger margins, net incomes, and better balance sheet are what make me give Verizon the nod today. 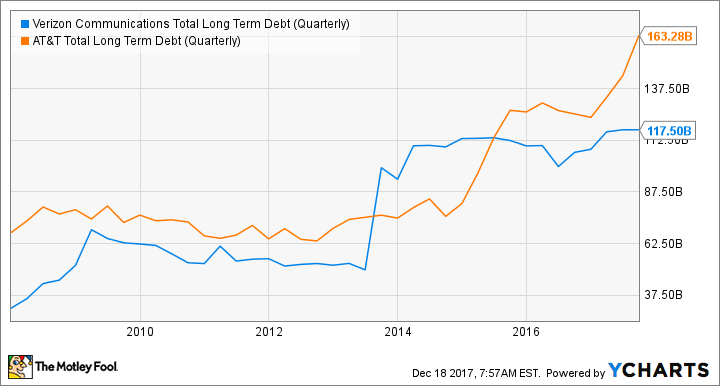 I like AT&T's strategic direction, but it seems to be adding an awful lot of debt to grow its scale, and that's a risk I don't want to take in the telecommunications business.